Do yourself a favor and make this dinner before you even try to describe what it is to your family. If you are anything like me, you just won't do it justice and your family will flatly refuse it before you even get to your stovetop. Later, of course, when you are eating the bowl of taco rice that was rejected earlier by said family members, they will look at you like you tricked them and demand a do-over. "I didn't understand what you were asking" they will say, "I want some of that." At least, of course, if your family members are anything like my husband. At that point, however, you are already savoring the spicy meat, the crisp lettuce, the melty cheese and the fluffy rice and you may or may not be inclined to share any of it with him. To be fair, part of the problem could have been my describing it as a Japanese taco dish with rice. (Which is is, according to wikipedia, BTW. Side note: Do you ever sit around and try to remember what we did before Wikipedia? Or the internet in general? I think we called people a lot more and went to the library more. I think. I'll have to google it some time.) Maybe a more apt description would be Tex Mex meets Rice. 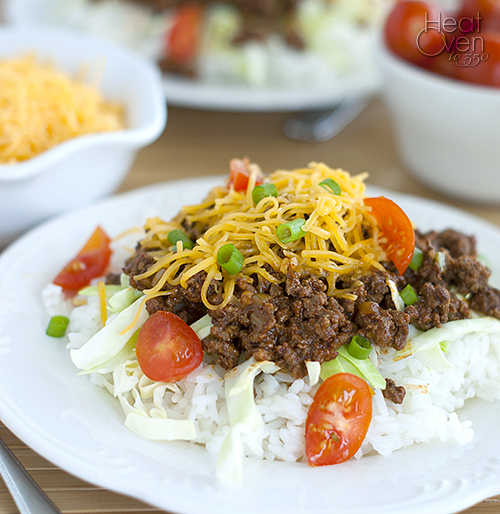 Seasoned taco beef is served on rice with lettuce (or cabbage), tomatoes and cheese for a wonderfully spicy/starchy/cheesy meal. It's very easy and quick, and easily adaptable to individual tastes. I like that it uses no seasoning packets since I'm a control freak like that. If you need a little change from taco night at your house, this would be an easy way to mix things up a bit. Heat oil in a 12 inch skillet over medium heat. Add onion and chili pepper (if using) and saute until onions are soft, about 5 minutes. Stir in garlic and cook another minute. Add chili powder and cumin and cook until fragrant, about 30 seconds. Stir in ground beef, breaking up large pieces with a wooden spoon. Stir and cook beef until cooked through. Stir in tomato sauce and soy sauce and cook until warmed. Season to taste with salt. 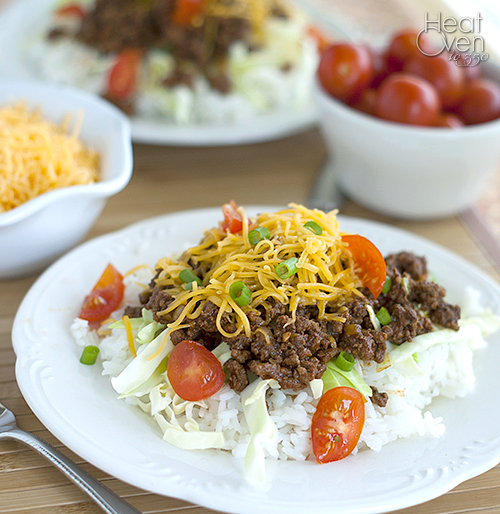 To assemble the taco rice, add 1/2 cup cooked rice to a bowl or plate, then top with lettuce, cooked beef mixture, cheese and tomatoes. Repeat with remaining rice and beef. This looks delicious. I'd love to try this! We make something like this a few times a month to use up leftover rice. Love it! Yum! Love the idea of putting this over rice...stuffing it into a taco shell or tortilla is always too messy! This looks fresh and delicious, Nicole! By the way, I just got back from Boston today. It was an amazing trip -- I loved every minute. Fenway is THE coolest ballpark ever, too!